Boyds, Md. 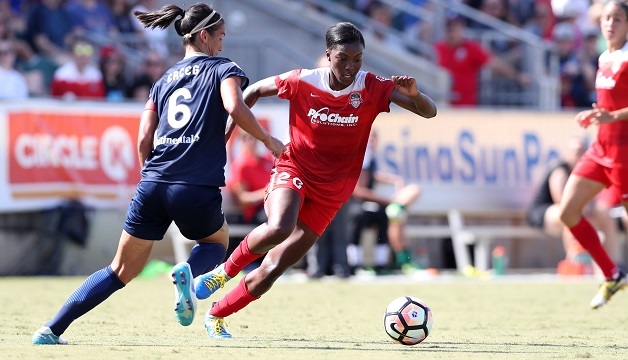 (Jan. 15, 2019) – Washington Spirit forward Cheyna Matthews has kicked off her first-ever training camp with the Jamaica Women’s National Team. She will train and play alongside Spirit Reserves forward Chiny Asher, who emerged as a key playmaker for the Reggae Girlz during the 2018 Concacaf Championship. Matthews has earned her first call-up with the Reggae Girlz at a historic time, as they begin preparation for the 2019 FIFA Women’s World Cup in France. Drafted by the Spirit in the first round of the 2016 NWSL College Draft, Matthews scored eight goals in her first two seasons with Washington. She missed the entire 2018 season due to pregnancy and maternity following the birth of her son, Josiah. She will aim to return to NWSL play in 2019, while also potentially representing Jamaica in their first World Cup appearance. Jamaica became the first Caribbean country to qualify for the Women’s World Cup after defeating Panama in the third-place game at the CONCACAF qualifying tournament in October. Jamaica drew Group C in the Women’s World Cup, alongside Australia, Brazil and Italy.